We see a fair number of photos of light pillars – shafts of light extending from the sun or other bright light source – taken from northerly latitudes. This one is caused by the moon, and it’s over Earth’s South Pole. 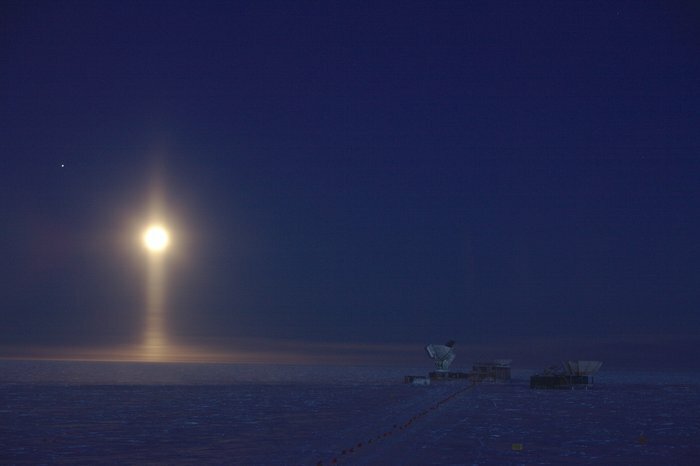 Light pillar extending from the moon, by D. Michalik/NSF/SPT. The European Space Agency (ESA) released this beautiful image to the public on January 21, 2019. Taken by Daniel Michalik, a research fellow at ESA, it was a winner in the astronomy category in the Royal Society photography competition in 2017. It shows what’s called a light pillar. … the dry, cold conditions allow for observations of a number of rare celestial phenomena that are seen far less often elsewhere. The sight captured beautifully here by Daniel is a good example of such a phenomenon: a light pillar. Bottom line: An award-winning photo of a light pillar – made by the moon – over the South Pole.